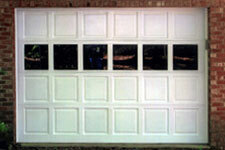 The model 232 is a residential 1 car or 2 car wooden garage door. The 232 is 1 3/8 thick and available in sizes up to 18 feet long. The model 232 is made of all solid hemlock meeting rails for a long life. The 232 is available with flat masonite panels, raised hardboard panels, or raised or flat hemlock panels with many optional glass designs available to match the special decor of your home. 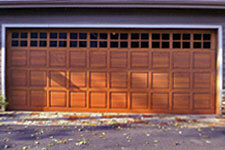 The model 232 is also available in other species of wood for quoting by request. Replacement sections also available. Shown with optional raised hardboard panels and glass center section. Shown with optional raised hemlock panels and stockton glass top.